Many, many years ago-centuries ago, in fact-there lived a people with oak colored skin and almond eyes, herders on horseback and camel who followed sheep and goats and yak across ancient grasslands at the top of the world. Theirs was a land of bitter extremes, wind-swept steppes bounded by jagged peaks, long winters cold beyond imagining that melted into short green grassy summers when the herds multiplied and there was milk and meat in abundance. Long before the time of Christ, before Buddha and Mohammed, these tribes held a belief in the sacredness of all things and the need to keep a balance-balance between the world of people and the world of nature, and with the worlds above and below. Everything they did reflected this belief. Trees were scarce, so the herders drew from their animals to create shelter. They layered sheep’s wool, sprinkled it with water and worked it into felted mats. 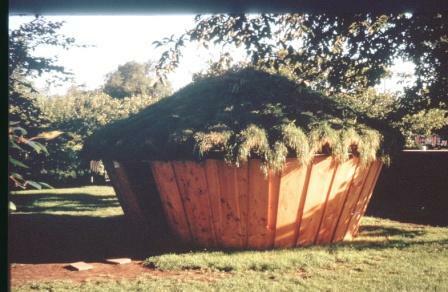 Roof struts made from saplings were slipped into a central wooden ring, then tied to the top of circular lattice walls and covered with the felted mats. 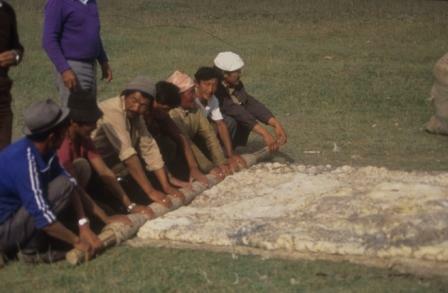 The herders tied the felt to the roof and walls with ropes and belts made from animal hair. In the winter extra mats were added for warmth; in the summer fewer layers were used. Sections could be raised or even completely removed in hot weather to allow for airflow through the shelter. The original word for “nomad” came from a word for felt, making the nomads “felt people”. These felt people called their circular, lattice-walled shelters “home,” ger (rhymes with “air”) or uy (oo-ee) which today helps us define what is a yurt. It was a shelter that enabled them to live sustainably in the harshest of climates, to move with their herds, to live in tribal communities and raise their families century upon century in a manner that was simple yet comfortable and in balance with the world around them. We don’t know exactly where the yurt originated. The Buryat Mongols of Siberia claim their land as the birthplace of the Mongol tribes and also of the ger. Wherever it began, use of the ger spread with the conquests and empire of Genghis Khan in the 13th and 14th centuries. 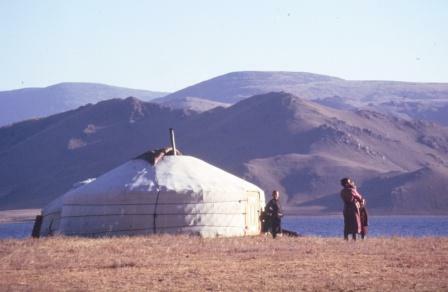 The Turkic nomads west of Mongolia call their yurts by the name eu, oy or uy (meaning “dwelling”, or “home”). 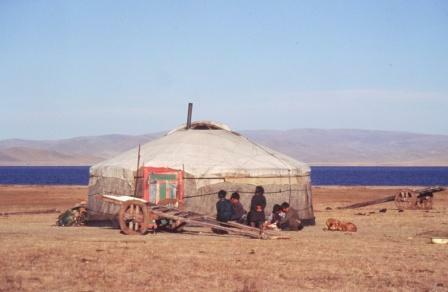 These nomads include numerous tribes inhabiting the steppe-lands from Iran in the west, as far east as Western Mongolia and south to Afghanistan. Common factors are language (all speak dialects that are Turkic derivatives) and religion (most are Muslim). 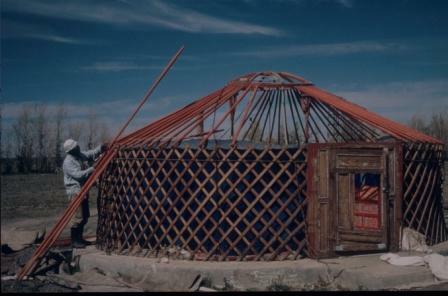 There are a number of differences between the Mongolian and Turkic versions of the yurt. The Mongolian roof poles are straight, where the Turkic poles are bent so that they serve as both the top of the wall and the roof. The Mongolian tono, or central roof ring, requires an artisan with carpentry skills and tools to produce it. 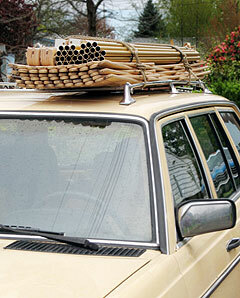 It is so heavy that Mongolian gers usually use supports for the tono, called bagana. 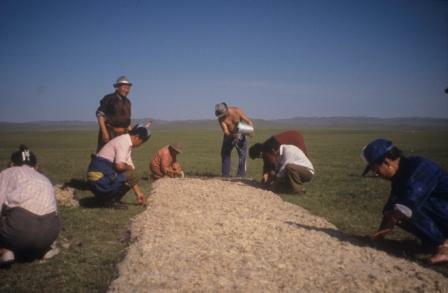 The Turkic roof ring is lighter and simpler to fabricate than the Mongolian version, and does not require supports. Mongolian doors, considered a symbol of status, are heavy wooden single doors. 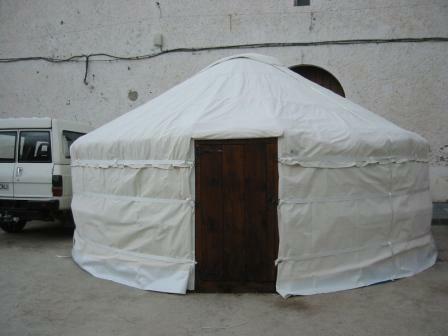 If a Turkic yurt has doors, they are two-piece and open inward. 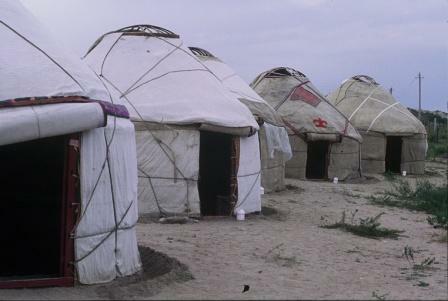 Many Turkic yurts, however, use flaps of felt or colorful rugs to cover the doorway. These felted doors are often quite beautiful, with stitched or appliqued patterns on them. 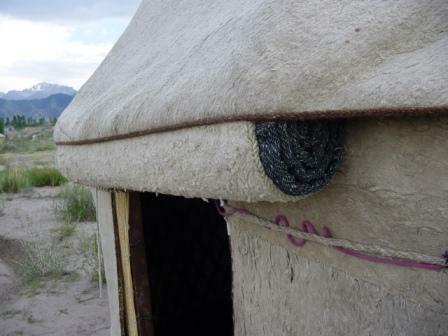 Another variation common in parts of western Central Asia is the use of a reed wall instead of (or in addition to) felt. On hot summer days the felts may be raised, and the reed wall allows for airflow while keeping animals out. Kirghiz yurts, in particular, use a lot of color and design motifs in both felted and reed work. In both Mongolian and Turkic tribes, it is the women who are responsible for a major part of the creation and upkeep of shelter (this is common in nomadic cultures worldwide). 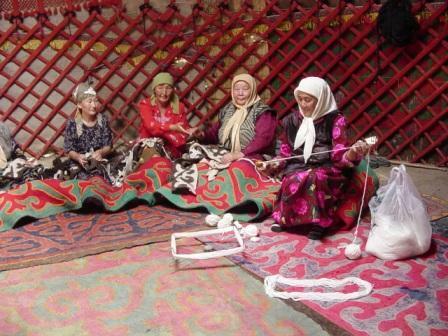 The women are in charge of the felting process, usually a community event, and of patching the felt when it wears thin. They weave the rugs that become floor coverings and wall hangings, and the belts that go around the yurt, holding the lattice wall together and the coverings in place. 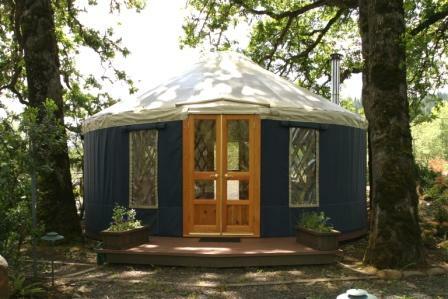 The circularity of the yurt is perfect for nomadic uses. The circle encompasses the greatest space possible internally for the amount of materials used. At the same time, the circular shape leaves the least amount of exterior surface exposed to the elements (thus making it more efficient to heat) and leaves fewer surfaces exposed to wind, which very naturally moves around it since there are no corners. 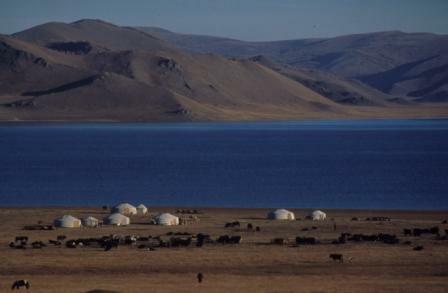 For Mongolians, the ger is more than their traveling shelter on the Asian steppes; it is their centering point in a moving universe. The internal floor plan of the ger is based on the four directions, much like the Native American Medicine Wheel or the Navajo hogan. The door always opens to the south. Opposite the door, sacred space is to the North. If the family is Buddhist, this is where the altar sits. It is also the place of the seat of honor for guests. Yin and yang, ancient symbols for feminine and masculine and the balance of life, hold space to the east and west. The western half of the ger is the male area and the eastern half, the female domain. Men’s possessions (riding tack, hunting gear, and whiskey) are hung on the western wall sections. Men and male guests usually sit on this side. Women’s tools, such as pots and pans and looms and felting equipment, are stored on the east side of the ger, where women, children and female guests usually sit. One proceeds around the ger in a clockwise or “sunwise” direction. In the ancient Shamanist tradition, it is the ger that holds the balance and flow of yin and yang, and of worlds above and below. All of this is centered around the sacred fire, entryway to the sacred world below and provider of warmth and light and the smoke that rises to the world above. In this way the ger expresses the balance of all things in the one, the circle. 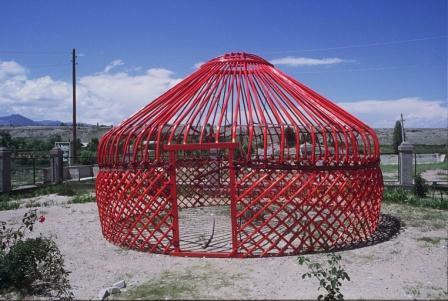 When North Americans use the term “yurt”, they are referring, not to the Central Asian ger, but to a version made from modern materials, including steel aircraft cable and architectural fabrics. Behind the development of this new form of shelter lies a story of visionary designers and a movement committed to principles of simplicity and sustainability. 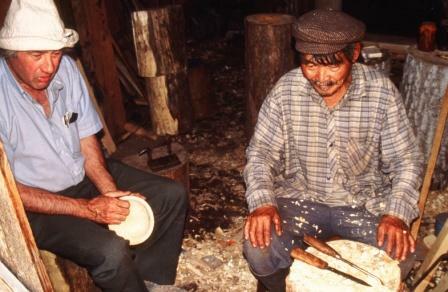 In the early 1960’s a man named Bill Coperthwaite was teaching at a Quaker school in New Hampshire while pursuing an ongoing exploration of indigenous crafts and culture. His math students had completed their required curriculum and were exploring the mathematics of roof design. When Bill saw a 1962 National Geographic article by Supreme Court Justice William O. Douglas about his trip to Mongolia, he was inspired. Here, in the Mongolian ger, was an indigenous design that could be adapted with the potential for creating more livable, accessible shelters. Bill’s math class built a yurt roof, but already the design was changing. Instead of straight roof struts, the roof they built had a lattice framework and no central compression ring. From New Hampshire Bill moved to Grass Valley, California. Here he built, with students, the first complete yurt with lattice walls, a lattice roof structure and a cloth covering. Realizing that yurts made a great teaching and community-building tool, Bill began building wooden tapered-wall yurts with groups of students. In 1968, as part of his Doctoral program at Harvard, he worked with a group of students from the Study Travel School to build a campus in New Hampshire comprised completely of tapered wall yurts. This led to ongoing projects with schools and communities and Bill’s designs continued to evolve. 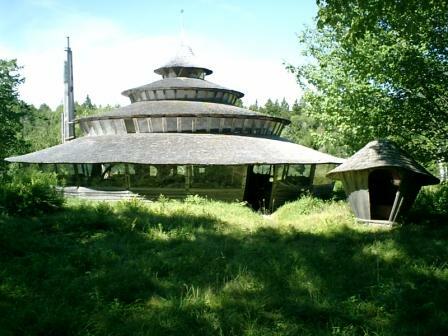 In 1972 Bill established the Yurt Foundation to continue his vision of studying indigenous cultures and applying their technologies to modern culture to design a simpler, more harmonious and sustainable way of living. 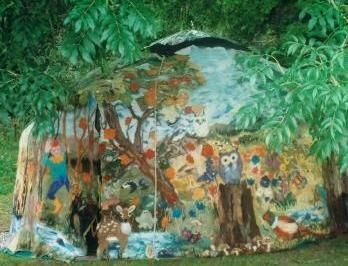 Chuck Cox, one of Bill’s students, built a canvas-covered version of the yurt as a student project at Cornell University. One of the changes from the Mongolian ger was a steel aircraft cable that sat on top of the trellis wall and functioned as the tension band. Roof rafters were notched and sat on the cable, instead of being attached directly to the trellis wall. Chuck and his wife Laurel produced a set of portable yurt plans that became the basis of modern canvas yurt design in North America. 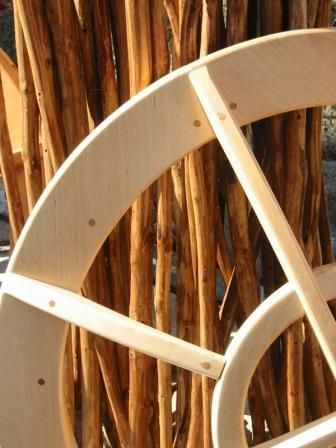 In 1978 another student, Kirk Bachman, built a canvas yurt using the Coxes’ plans as a project at Idaho State University. When Kirk graduated and became a back country guide in the mountains of central Idaho, he lived in his yurt. His employer asked him to build a few yurts as experimental backcountry ski huts, and a national phenomenon was born. Today yurts serve backcountry uses coast to coast, servicing Nordic hut-to-hut skiers and summer hikers alike. 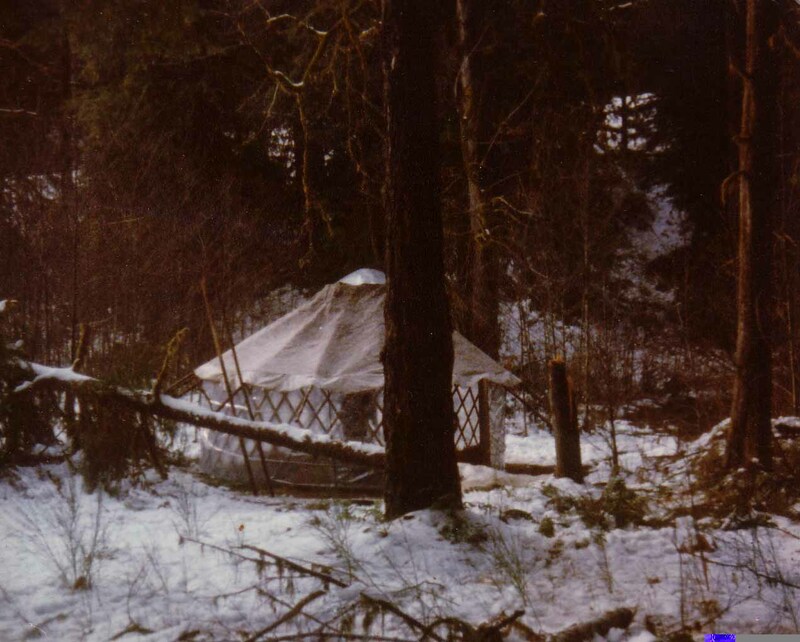 Another group using yurts in the Northwestern US was a group of hippie tree planters called Hoedads, who in the 1970’s were living in the woods and replanting Oregon’s forests. Hoedad mathematician Charlie Crawford decided the yurt would be a perfect shelter. Using the Coxes’ plans and later printing his own, Charlie produced numerous canvas yurts for the Hoedads under the name Cascade Shelter. Picking up where Crawford left off, former Hoedad Alan Bair and his friends started Centering Shelterworks in Cottage Grove, Oregon, introducing innovations like NASA-developed insulation and architectural fabrics. 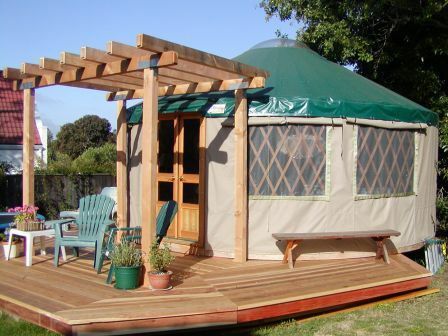 While continuing to perfect yurt design with his company, now called Pacific Yurts, Alan marketed fabric yurts locally, nationally, and eventually worldwide. It was Alan who worked with the Oregon Parks Department to develop the use of yurts in campgrounds, now a national phenomenon. While Alan was developing Pacific Yurts, Don and Emma Kiger were building tipis in Colorado and developing their own unique fabric yurt design which grew into the Colorado Yurt Company. Blue Evening Star, a tipi maker, incorporated tipi design into a unique form of yurt geared to Southwest living. Through her book “Tipis and Yurts” and her yurtbuilding workshops, she helped spread the word about yurts and living lightly. 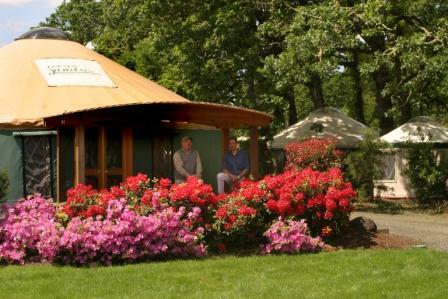 Other fabric yurt companies that came up through the 1970’s and ’80’s included Borealis Yurts in Maine (which folded in 2001) and the similar Nomad Shelter operating out of Homer, Alaska. 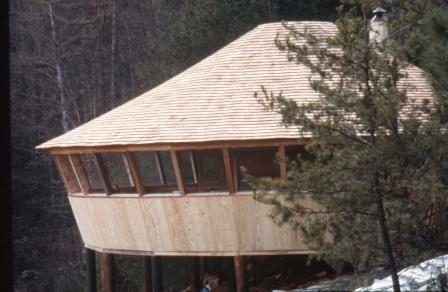 The fine woodworking aspects of the Rainier Yurt design reflects its origins in the 1990’s with yacht builder Will Hayes (formerly Nesting Bird Yurts). 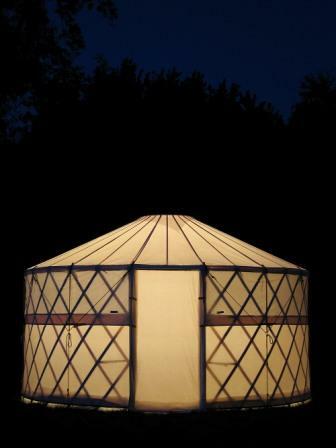 Canadian company Yurtco also started in the 90’s and has grown to become Canada’s largest purveyor of yurts, with its own design innovations. 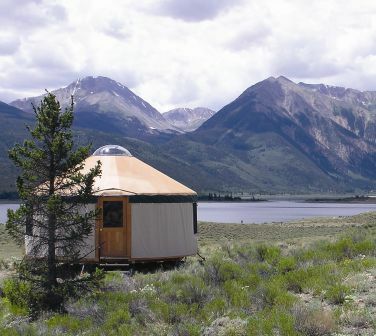 One of the most interesting recent innovations is the exceptionally portable camping or backyard yurt, developed by GoYurt Shelters and Rainier Yurts. These yurts come with a ground cloth and can be put up by two people in about an hour. GoYurt Shelters has an additional focus on sustainable materials like FSC certfied wood, natural canvas and non-toxic finishes. 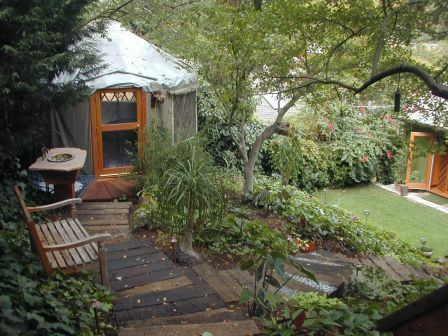 Fabric yurts work especially well for modern nomads and people in transition. Typical of nomadic shelters, they use minimal materials and are light on the land, combining environmental sustainability with a high degree of comfort. Building the wooden deck takes carpentry skills and a week or two to complete, but putting up the yurt itself takes less than a day, or two days for a 30′ yurt. 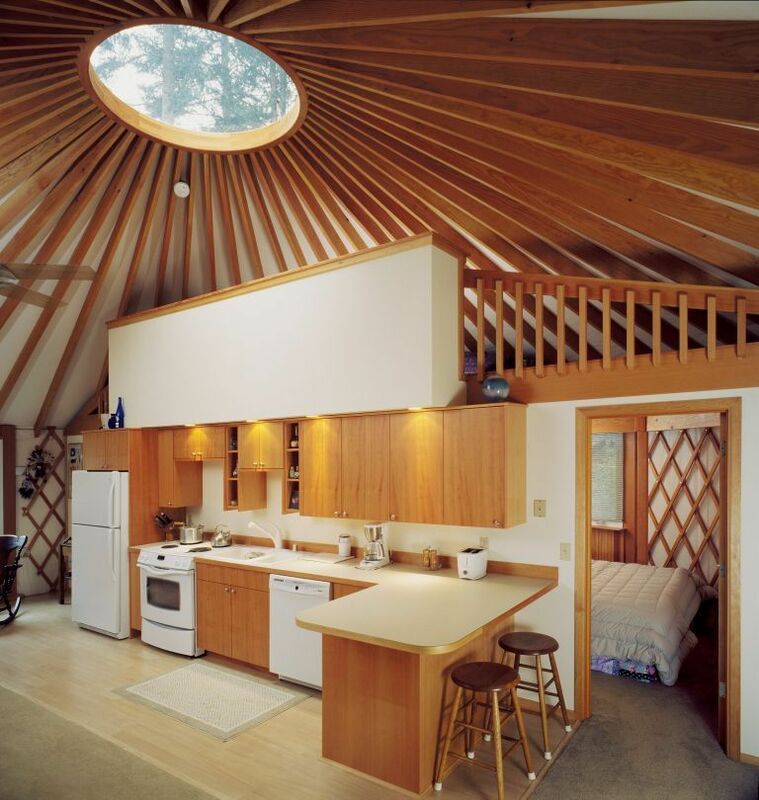 One of Bill Coperthwaite’s students in the late 60’s, a gifted 17-year-old named David Raitt, took up yurt design and building as his passion and vocation. 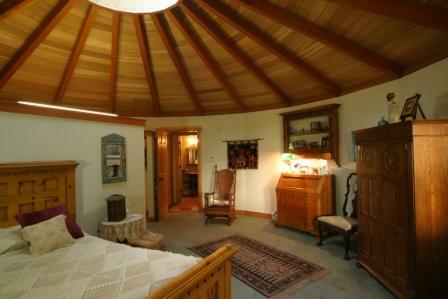 David built yurt homes and communities in New Hampshire and California and eventually established California Yurts. 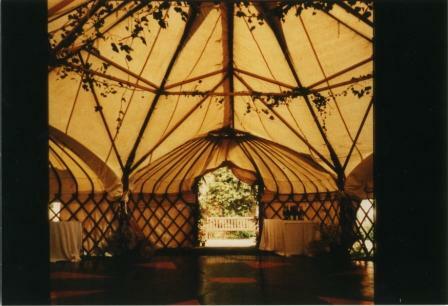 David’s designs evolved from the original tapered wall yurt to a straight walled version. Building both roof and walls as framed-in panels (which could be pre-fabricated and transported to a site) made it possible to meet California’s stringent building codes while still keep costs affordable for the homeowner. David added some unique design modifications, extending portions of the circle outward to add extra rooms or “wings” and even using the spiral shape as the basis for an extended roof section on his Nautilus design. 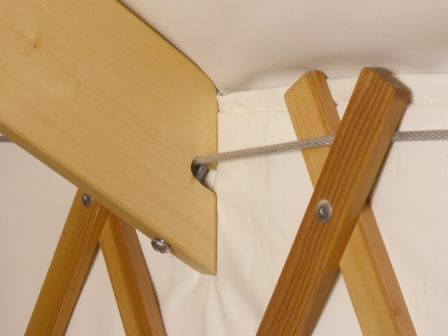 The “frame panel” yurt could also be built with two stories and joined together with rectangular connectors. 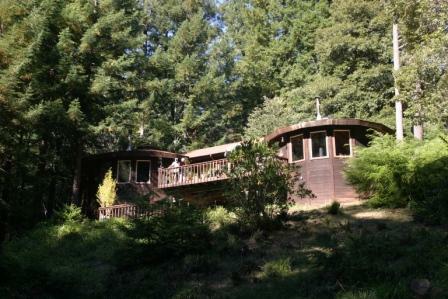 Architect Morgan Reiter caught the yurt bug as a student in the ’60’s while visiting yurts designed by Bill Coperthwaite. 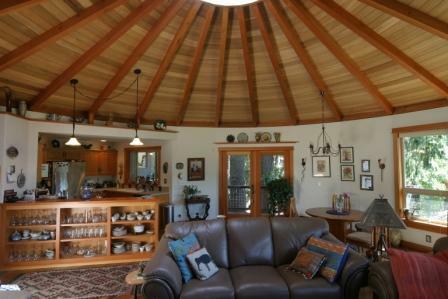 Morgan combined his study of indigenous architecture with the Coperthwaite and Raitt designs to build himself a yurt when he moved to Oregon. 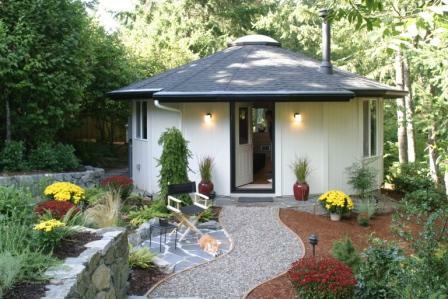 Friends asked Morgan to build them yurts as well, and Oregon Yurtworks was born. Australian Mike Shepherd was inspired by David and Annie Raitt’s work with California Yurts and started Goulburn Yurtworks in his sheep-shearing shed in Australia. Along the way Mike created a kids’ “Back to the Basics” yurt camp, where children spend their days learning skills from milking cows to sheep-shearing and their nights sleeping in small wooden yurts around a central pond. Yurts in Spain, Czechoslovakia, France and England. 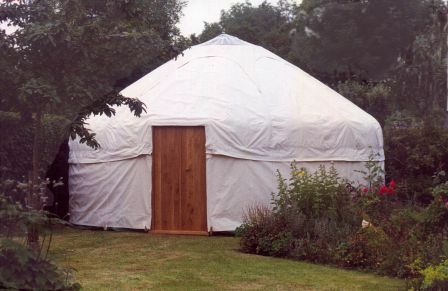 Yurt companies in the UK and EU have focused on building traditional yurts, both Mongolian and Turkic. 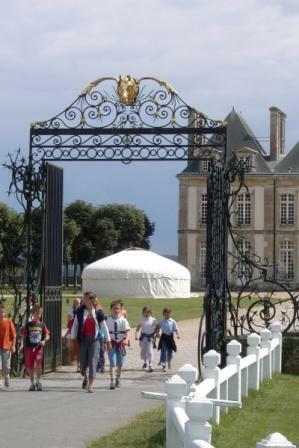 (One exception is Yourte Contemporaine, which imports the Rainer Yurts in France.) 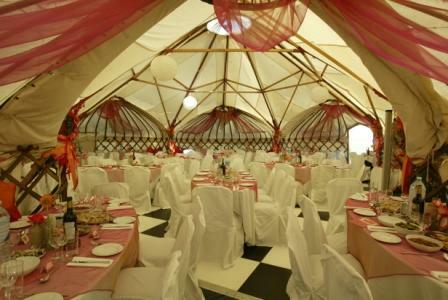 They also typically offer yurt building workshops, and rent out yurts for events. Key players on the European front include Hal Wynn-Jones, who has trained many of the finest UK and EU yurt builders on the Turkic version of the yurt. 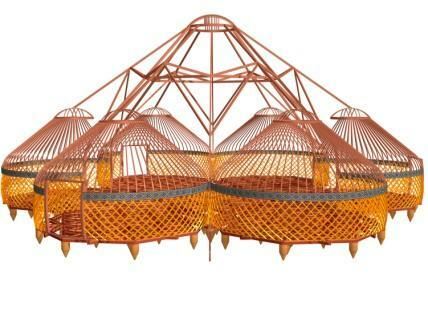 Wynn-Jones is best know for creating the “Multi-plex Yurt”, a composite of six partial yurt frames joined with roof struts to yet another central compression ring, available as an event rental. Welshman Steve Place of Handmade Hardwood Yurts produced a popular pamphlet on “How to Build a Yurt” with information and plans for a Turkic-style yurt. Likewise, Paul King’s Complete Yurt Handbook has become the Bible worldwide for the homebuilt yurt, both Mongolian and Turkic styles. In Japan, a fascination with all things Mongolian has meant the importation of traditional gers from Mongolia alongside of some frame panel yurts built by David Raitt. An interesting fabric yurt design produced by Taiyo Kogyo Corp (which builds stadiums using architectural fabrics) can be found in the May/June 2000 issue of Fabric Architecture magazine. Korea now has a modern fabric yurt company, Solongos Camp. 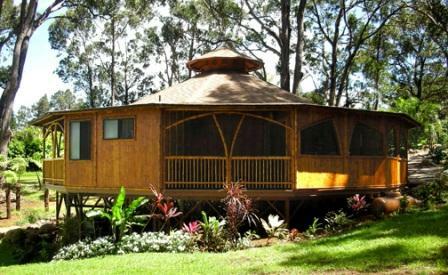 In Australia and New Zealand, however, the interest seems to be on importing traditional yurts. 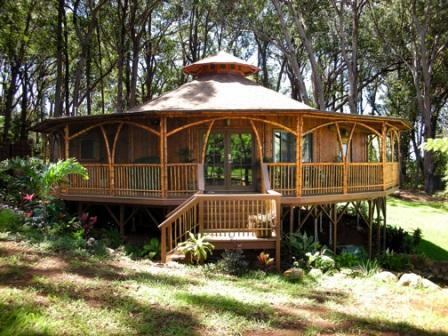 Hawaii hosts some interesting variants on the yurt made from indigenous bamboo and created by Bamboo Living Homes. There is something about the very shape of the circle that provides us a “glimpse into the wholeness, unity, and divine order of the universe,” says mathematical philosopher Michael Schneider. “The circle is a reflection of the world’s–and our own–deep perfection, unity, design excellence, wholeness, and divine nature.” (A Beginner’s Guide to Constructing the Universe, Schneider, p. 4) The very shape of the circle seems to connect us at a primordial, cellular level to the unity of all things, to our inter-connectedness with each other and our connectedness to the whole. 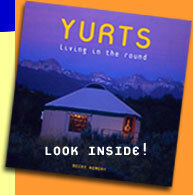 The yurt is a gift, an ancient nomadic shelter only recently available to modern culture. Versatile, beautiful and spiritual, both ancient and contemporary versions provide an option for shelter that is affordable, accessible and gentle to the earth. 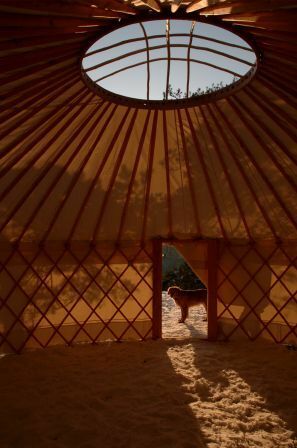 By its very existence, the yurt calls forth life in simplicity, in community, and in harmony with the planet. 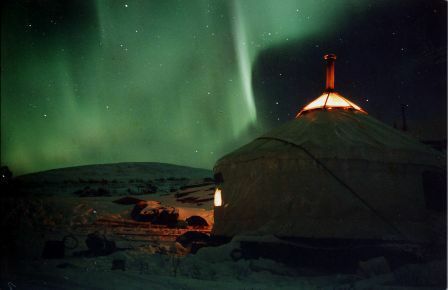 Whatever form of shelter one ultimately chooses, it is good to learn from this ancient nomadic path, from the people of the yurt, and from the circle itself as it speaks of the unity and interconnectedness of all things. The Scottish Storytelling Yurt–felted panels crafted by Scottish and Irish fabric artists and sewn together into a cover for a Turkic-style yurt..